Despite it being almost five years since we reached the tipping point of digital native HCPs, many within pharma still don’t have a good grasp of how they prefer to consume information. This has led to a significant misalignment between the types of communications that pharma is delivering and the kind that HCPs are eager to receive. A growing number of HCPs would like to communicate digitally with pharma – but a far smaller number are currently reached via digital channels. There’s a clear gap between digital demand and supply. We call this disparity the ‘Digital Divide’. The bigger the gap, the bigger the opportunity. 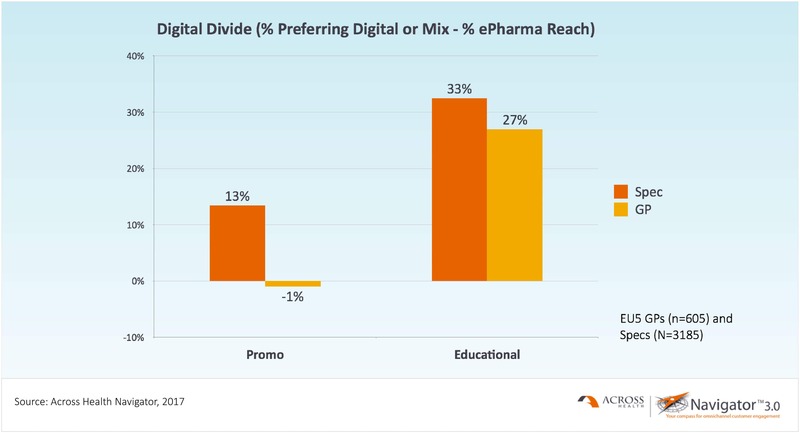 The Digital Divide exists in both medical education and brand promotion – and analysis of it can fuel important learnings for pharma. The bottom line is simple: progressive companies that effectively leverage digital channels in ways that match HCPs’ preferences can create a real recipe for success. But the first step is to understand the key ingredients. The main course: what are HCPs consuming? 2017 Navigator data confirms that HCPs’ growing hunger for digital communications is not being satisfied. In Europe, there’s evidence that pharma is serving them a suboptimal diet of information; it’s akin to force-feeding them hamburgers when they really want steak! The nutritional implications of an imbalanced diet are significant. In the same way that fast food can be unhealthy and unfulfilling, inadequate communications can very quickly leave customers needing more. Conversely, good information – served the right way – can, like the finest foods, be more satisfying, more memorable and ultimately sustain us for longer. So what are HCPs currently consuming? Let’s look at the data. The Digital Divide is most pronounced in medical education. There’s a huge appetite for online medical education, but it remains an unmet need for many. Navigator shows that more than half of specialist HCPs in EU5 would like digital-only or a hybrid of digital and traditional communications to satisfy their education requirements. However, fewer than 20% had actually received med ed via digital channels in the three months prior to the survey. This yields a bloated Digital Divide of almost 33%. 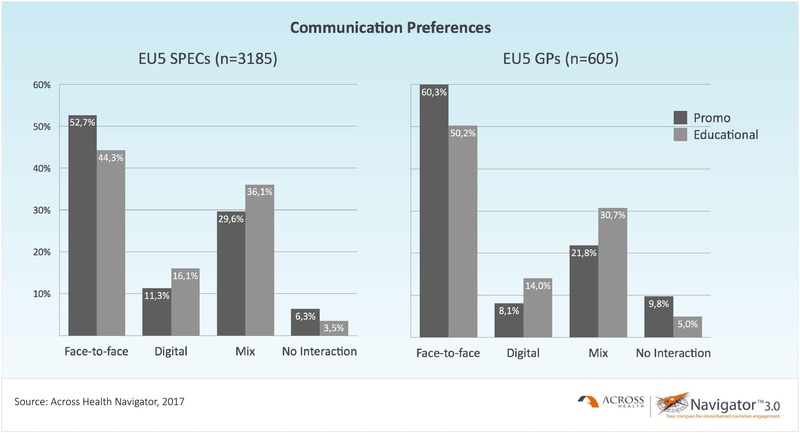 It’s a similar picture for GPs; almost 45% of EU5 GPs expressed a preference for a digital/mix for medical education, but less than 18% are actually being reached that way. Pharma’s customers are going hungry. The danger is that they choose to dine somewhere else. The landscape for brand promotion is more nuanced. At the macro level (EU5), Navigator reveals a negative Digital Divide (-1.1%) amongst GPs. This suggests that the level of digital promotion being delivered to GPs is relatively well balanced. But it also raises the question as to whether the content being received via digital channels is adequate or effective. The portion size is right – but the quality of the dishes may require some attention. In the case of promotion to specialist HCPs (EU5), the Digital Divide is wider (13.4%) – although it is much smaller vs the divide for medical education. So what does all this mean? In the first instance, the significant Digital Divide in medical education sends a clear message to pharma’s medical departments that it’s time they upped their game in digital. HCPs are hungry for digital– we really must satisfy their appetite. But we must get it right. Companies must look beyond ‘channel’ and examine the content and context of the communications they develop. They need to look at the deeper elements that drive a successful online communication; what kind of topics should a webinar cover? How long should a webinar be? Who should present the information – a KOL or a pharma exec? There are lots of factors to explore – but if you don’t get the context, content and format right, the recipe won’t work. For marketers it’s a similar message. The Digital Divide in brand promotion is less pronounced – but the negative divide at the macro level is a worrying sign. If over-provision continues and the gap grows wider, the impact of brand promotion will deteriorate. And no-one wants stale food. Marketers need to look closely at the content they’re pushing through their channels and find more effective ways of delivering it. As the rise of the digital native HCP gathers pace, evidence of a Digital Divide reveals a pharmaceutical industry at the cusp of a great opportunity. It’s time for some nouvelle cuisine. Because, ultimately, the old menu will only eat into your profits. It’s food for thought.